I recently binge-watched the first season of The CW drama Riverdale, and loved it. The show kicks off its second season tonight at 8 p.m. ET/PT. In "Chapter Fourteen: A Kiss Before Dying," as Fred's (Luke Perry) life hangs in the balance following the shooting at Pop's diner, Archie (KJ Apa) struggles with the emotional aftermath of what he witnessed. 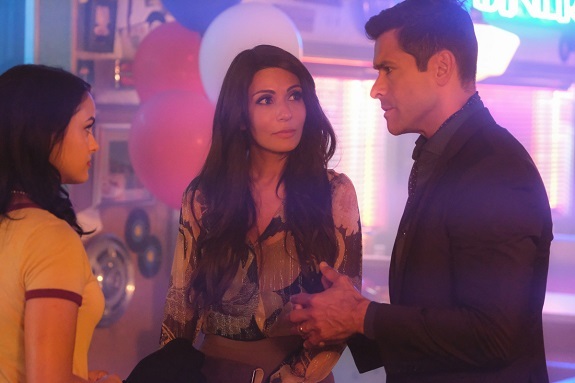 Meanwhile, as Veronica (Camila Mendes) steps out of her comfort zone to support Archie, she learns that her father Hiram (All My Children alum Mark Consuelos) has arrived to Riverdale earlier than expected. Elsewhere, at Pop's diner, Pop Tate (guest star Alvin Sanders) recounts the chilling details of the shooting, which leaves Jughead (Cole Sprouse) and Betty (Lili Reinhart) questioning the gunman's true motives. Lastly, after running into Cheryl (Madelaine Petsch) at the hospital, Betty and Kevin (Casey Cott) are surprised to learn about the fire at Thornhill.